Taeniasis in humans refers to parasitic tapeworm infection caused by the Taenia species of worms. There are more than 30 species of Taenia tapeworms, but the two most important species causing tapeworm infections in humans are the beef tapeworm (T. saginata) and pork tapeworm (T. solium). Fish tapeworm (Diphyllobothrium latum) can also result in tapeworm infection, though it is not of the Taenia species and is therefore not responsible for taeniasis as such. Humans get tapeworm infections by eating raw or undercooked pork (T. solium), beef (T. saginata), or fish (D. latum). In the majority of cases, tapeworm infection produces no symptoms or very mild symptoms. However, in rare cases it can lead to serious complications like cysticercosis, a nervous system disease. Taenia saginata (beef tapeworm) and Taenia solium (pig tapeworm) are found worldwide affecting about 50 million across the globe. Infections with T. saginata are common in areas where contaminated raw beef is eaten (like in Latin America, Eastern Europe, East Africa, and Russia). T. saginata infection is rare in the United States, except in areas of high density of cattle and people, and poor sanitation. T. solium infection affects about 4% of the US population. T. solium infections are more common in under-developed communities with poor sanitation (like Latin America, sub-Saharan Africa, Eastern Europe, India, and Asia) where people eat raw or undercooked pork. Fish tapeworm (D. latum) infections are seen in areas where freshwater fish are eaten in raw or undercooked form. This infection is commonly reported from Eastern Europe, North and South America, Scandinavia, and some Asian countries. About 50,000 people around the world die every year as a result of cystericosis. 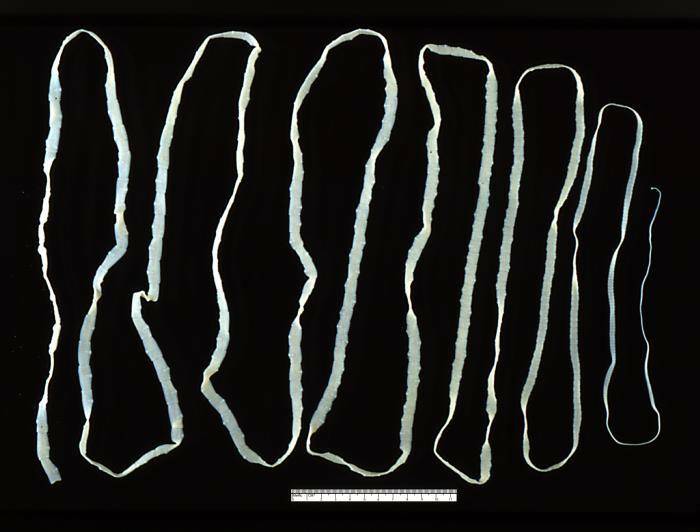 Human tapeworms reside in the small intestine. This is the longest portion the gut where most of nutrient absorption occurs from food that is eaten. By locating itself here, tapeworms are therefore able to feed off the nutrients in the gut. In the process, the human body loses on these essential nutrients. The tapeworm attaches to the inner lining of the small intestine (mucosa) by its head, also known as scolex. The body of the worm grows in segments. proglottids, and can hang freely within the lumen of the small intestine. When the worm dies or detaches from the small intestine, it passes through the cecum into the colon and is evacuated from the body through the stool. How do tapeworms infect humans? Humans are the only primary hosts for T. saginata and T. solium, which means these tapeworms can mature and reproduce inside humans only. Cattle (in case of T. saginata) or pigs (in case of T. solium) contract tapeworm infections by eating vegetables or plants contaminated with tapeworm eggs or tapeworm body segments (proglottids) with eggs. Once the eggs reach the animal’s intestine, they hatch and attack the intestinal wall, and migrate to the muscles. In muscles, they develop into cysticerci (singular ~ cysticercus), which can survive for several years inside the animal. Humans get the infection by eating raw or undercooked infected meat of such animals. Once the cysticerci reach the human intestine, they develop over 2 months into adult tapeworms. The adult tapeworms attach to the small intestine using their mouth parts and can reside here for years. Adult tapeworms produce proglottids which mature, become filled with eggs, detach from the tapeworm, and travel through the colon mixing with the feces. Eventually the proglottids and eggs are passed out with the stool. Eggs in the proglottids are therefore released in the environment. These eggs can survive for days to months. When human sewage contaminates areas where animals are feeding, these eggs then enter the animals like cattle and pigs. The entire cycle starts again. Most people do not experience any symptoms of taeniasis. Even when symptoms are present it is often mild to moderate and either ignored or confused for other gastrointestinal complaints. How do you know if you have tapeworms? Fish tapeworm infection may lead to anemia and vitamin B12 deficiency. The complications of adult tapeworm infection include appendicitis, blocked bile ducts or pancreatic duct, tapeworm growth in middle ear or uterus, cysticercosis and neurocysticercosis. In cysticercosis, the cysticerci are found in muscles, under the skin, in the eye and the brain. In the eyes, the cysticerci can cause severe pain and blurred or lost vision. Neurocysticercosis patients show three characteristic symptoms – seizures, high pressure inside the skull, and psychiatric disturbances. The symptoms may develop when floating cysticerci block cerebrospinal fluid (fluid filling and surrounding the brain and spinal cord). Seizures are more common in children. Travelling to areas where T. saginata or T. solium infections are common. Sourcing meat products from suppliers who are not reputable and preparing food in unhygienic conditions. Using contaminated human feces as manure. Eating contaminated raw fish in dishes like sushi and sashimi. Stool samples of people with taeniasis-like complaints are examined. Presence of eggs or proglottids in the stool confirms the infection. Cysticercosis can be diagnosed through imaging procedures like computed tomography (CT) scan, magnetic resonance imaging (MRI) scan or radiography. Retinas can be checked for the presence of freely floating cysticerci which is an uncommon complication of taeniasis. Taeniasis can be effectively treated with medication in most cases. Surgical measures are reserved only for severe infections. Many patients with intestinal Taenia infection who do not show any symptoms or present mild symptoms. Such patients do not require any treatment. Anthelmintic therapy is recommended if adult tapeworms are detected in the stools. Niclosamide, albendazole, praziquantel or albendazole-praziquantel combination are given orally to kill the worms. Dead worms or their body segments pass out in the stool. Since the dead worms can cause inflammation, high-dose glucocorticosteroids are also given with anthelmintic drugs. Patients with fish tapeworm infection are given vitamin B12 injections and supplements to treat anemia. Anthelmintic drugs cannot be used in individuals in whom the infection has reached the major organs (like the eyes, spine, and brain) because of a risk of inflammation. If worms or their body parts get lodged in and block bile or pancreatic ducts. In cases of appendicitis resulting from tapeworm infection. For ocular cysticercosis (presence of larva in the eye).